This post marks the 1 year Blog Anniversary of Virginia Vine Spot. Wow! Over 125 posts, many friends, and a countless number of memorable bottles later, this journey into the wonderful world of wine continues to be an educational and enjoyable ride that I frankly did not see coming. I have toyed with train sets, model cars, RC Planes, guitars and numerous other short lived hobbies. 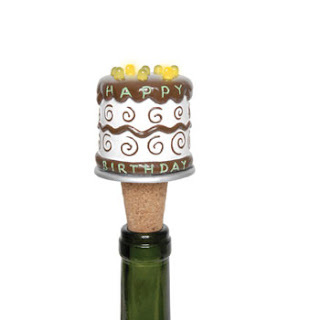 Wine, however, has been my mate for 2 years now and we have many happy corks and screw caps ahead! The picture below was taken of me mid April of 2005 while visiting Jefferson Vineyards. This is a memorable photo for me because it was my very first visit to a winery of any sort and my first taste of wine. Dezel admits to being a late bloomer to wine, but better late than never, right? 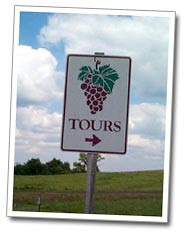 Actually, had it not been for the Virginia grape sign we saw from the road, we would have never stopped at the winery. Good thing for those darn grape signs, friends! Yeah, I was green as a Leprechaun, but slowly ripening! Since many people ask me the how and why regarding Virginia Vine Spot, here is the lengthy short spill on how and why it came about. During that tasting at Jefferson Vineyards in 2005, I can look back and say now that I had not a clue what the Tasting Associate was talking about. They very well could have told me that Norton, Merlot and Chardonnay were brothers who ran a barbeque outfit up the road, and I would have said, “Great, let’s go eat!” My wine knowledge was zilch, but on the bright side, I sure did enjoy the atmosphere and ambience of Charlottesville, Virginia. One of many Charlottesville picturesque views! For me, the trip to Jefferson sparked a desire to learn more about wine. The following year we spent many weekends attending wine festivals, wine events and paid many visits to local Virginia wineries. 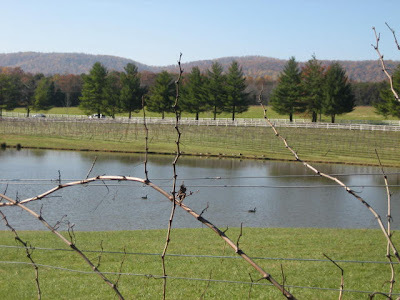 Through those intimate local experiences it was apparent that there were a number of family-run farm wineries here in Virginia that was passionate about producing small lots of quality handcrafted wines. Also, following some self-study and research on the history of wine and the importance of various wine producing regions, namely the Old World and California, I decided a trip to a large wine store such as Total Wine was necessary. Upon walking into Total Wine I realized that I was living smack dab in the middle of the golden age of wine. Just about every wine producing region was represented in that store and I was on a tear to learn all about the past, present and future of these places, as well as their wines. Although I’m convinced that I may not be able to learn it all, or taste all in one lifetime, I’m certain that I can have fun trying. I have found that reading various wine books, listening to informative podcasts, visiting wineries, and most importantly – swirl, sniff, sip – over and over and over - have been key in my attempts to demystify and learn more about wine. Although I love Virginia wine, I also consume wines from all over our great globe and there are truly some special wines out there today. Learning more about these regions, their history, their winemaking techniques, climate and terrior, etc, in relation to the grape variety can add greatly to the appreciation and perception of that wine. A year into all this self-study I uncovered this new thing called a blog. I thought this would be the perfect way to share with friends and family my wine adventures here in Virginia. After all, this is a beautiful state, especially wine country. So I launched Virginia Vine Spot with that in mind; but wait, there was still one little problem. Well, let’s just say I did not make a “F” “C-“ in writing for nothing all throughout college. Thus, learning more about wine and writing are still a work in progress, it is highly fun and entertaining for me. To become good at something you have to practice, and I guess somebody has to taste those wines and read and sift through all those books, right? Fun stuff! Beware! These signs can be life changing. It was no more than a month or so into the site when I began receiving emails and comments from people other than family and friends and it dawned on me that other people were checking out Virginia Vine Spot. Since we were visiting a lot of wineries and developing friendly relations with the passionate people in the local wine industry, I decided that part of the wine site would be geared towards supporting and promoting the Virginia wine industry we had come to love. Nowadays, based on the number of considerate emails, comments, and kind face-to-face exchanges, I’m happy to be one of the many local supporters and promoters of our burgeoning wine industry. The other part of what I try to get across through Virginia Vine Spot is the education and enjoyment of wine on the global front. Think, learn, and taste globally – there is room for everyone in this world of red and white. However, it is a crowded and competitive market and that is where your education will lend itself to further your enjoyment of wine. For example, in my humble opinion, Virginia produces some standout Viognier, Chardonnay, and Cabernet Franc, New Zealand does a great Sauvignon Blanc, Oregon an exceptional Pinot Noir and Australia a dazzling Shiraz, with the South Africans reinventing a new style Syrah. Our friends in Chile are producing the best reds for the dollar, in my opinion, and Argentina is doing one heck of a Malbec (local: Waterford and Pearmund are to!). Let’s not forget the Californian Zinfandels and prized Cabernet Sauvignons and German Rieslings. Last, but not least, are those great French wines that I enjoy, where the fruit is more restrained, but lending itself to more complex wines with earthy and minerality nuances. Yummy! Mostly all the aforementioned grape varieties were founded by the French and are definitely worth seeking out! We can go on and on, but you get the picture I’m trying to paint. In closing, I would like to thank all the kind people I have met through this wine blog from as nearby as Alexandria, to as far away as New Zealand, for their pleasant words and support. Remember, there exists a story inside every bottle of wine, be it a story of elegance and sophistication, simplicity and commonplace, those handled with care, or more sadly, those left in neglect. I look forward to sharing some of those stories with you as best as I can translate them and will continue to promote and support the Virginia wine industry we have come to enjoy so much. Happy Sipping to many more fun-filled years, friends!